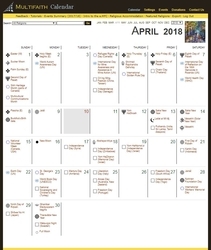 Electronic Version - Multifaith Calendar NEW! The Multifaith Action Society of BC has produced an On-line (web-based) version of their popular printed Calendar to meet the demands of the changing marketplace. At this time, the Electronic Version is only intended for corporate/institutional/larger organization customers. This web-based, online format is subscription-based and ideally made available to staff/employees/students through the customer's own intranet system. The e.MFC is fully customizable, including company/organization/institution logo, mission statement etc. as well the ability to hide/show selected events. No need to install any software since the e.MFC is hosted by the Calendar's own server. Click here to take a look at the e.MFC demo. A FAQ page is also available to answer any of your questions. A price chart based on the number of employees accessing the subscription is also available for consideration. A 12, 24, or 36 month subscription can be activated on the date of your choice. Take a look at this Electronic Version of the Multifaith Calendar and share it with your friends!